I don’t often make anything other than a card or a scrapbook page. I love handmade banners, boxes, bags, etc. I just never think to make them and I don’t think I’m that good at them. So it’s nice to be pushed to do something I resist doing now and then. 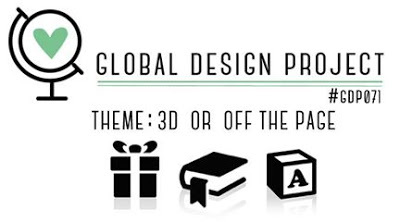 The Global Design Project challenge this week is to make anything other than a card. I made a simple banner — I say simple, but it took me quite a long time to make! It shouldn’t have, but it did. I wanted to have XO in there, too, so I put that on the ends. I have NOT told the kids that treats will appear in the bags on Valentine’s Day, because I don’t want them asking about it for the next sixteen days. *The letter flags are simple. 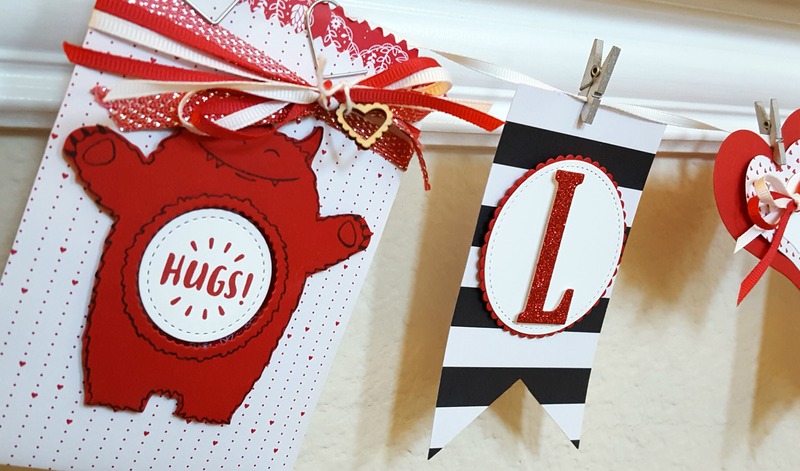 The banners are cut with the Banner Framelits from the Pop of Pink designer series paper. 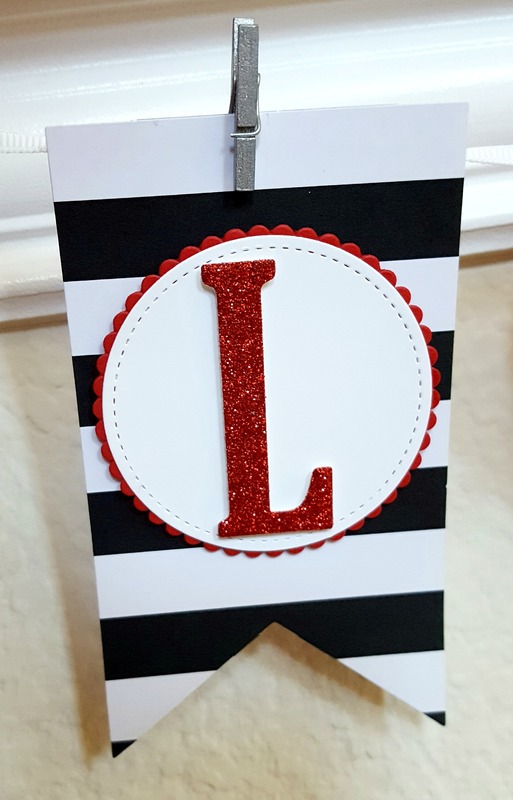 The letters layer as follows: Scalloped circle from the Layering Circles Framelits in Real Red cardstock. On top of that I used a Stitched Shapes Framelit to cut out the Whisper White circle. I cut the letters out of Red Glimmer Paper using the Large Letters Framelits. I only got these framelits a couple months ago, and I’m using them a ton now. I consider them a must-have. I popped the letters up on Dimensionals (you have to cut your Dimensionals smaller so they’ll fit). The whole circle is on Dimensionals on top of the flag. *The monster bags are my favorite part! Each bag is cut out of the Sending Love DSP stack (all Real Red & Whisper White — LOVE!!) using the Mini Treat Bag Thinlits (you could just put the monster on a flag instead of doing this as a treat bag). I love how the thinlit cuts the bag so both sides of the paper show. It makes it easier when you can’t decide which side you want showing! Before I taped up each treat bag (using Tear & Tape), I stamped the monster on the bag itself so I’d know where to place the “HUGS” circle. 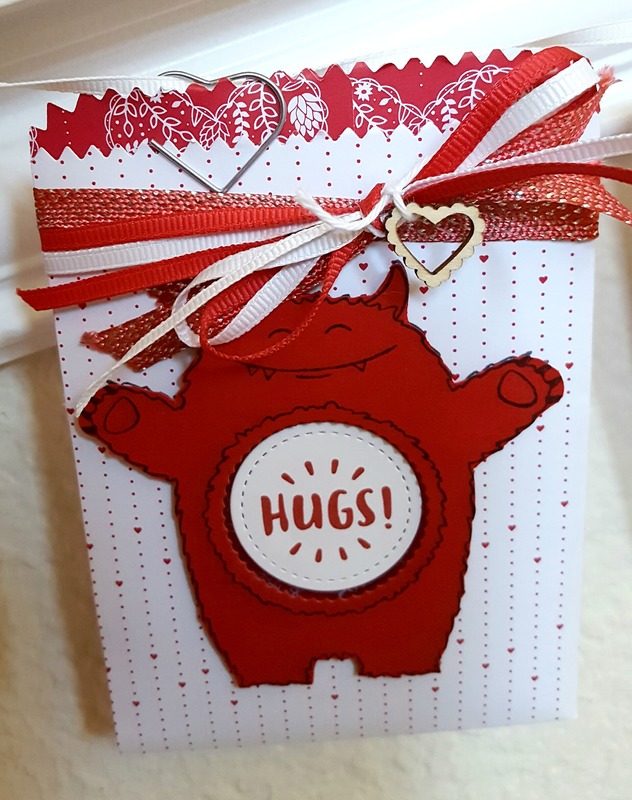 This stamp is from the same stamp set as the monster, Yummy in My Tummy; I stamped it then cut it out with one of the Stitched Shapes Framelits circles, then glued it down right in the center of the monster’s belly. Then I stamped the monster again on Real Red and fussy-cut him out. I cut the circle out of his belly using a scalloped circle from the Layering Circles Framelits. I popped the red monster up on Dimensionals. There are three different ribbons on my bag. The one that’s layered on the bottom is the FREE Sale-A-Bration ribbon. I absolutely ADORE this ribbon, because it’s beautiful to begin with, but it also takes color so well. I just squeeze my ink pad (while closed) to get a little ink on the inside of the cover, grab some of that ink with my Aqua Painter, and then paint the color on. Then let it dry, or dry it with your Heat Tool. Wrap this around the bag and tack it down in the back with Tear & Tape. It doesn’t matter what it looks like on the back — no one will see it. The other two ribbons come together in the Sending Love ribbon pack. 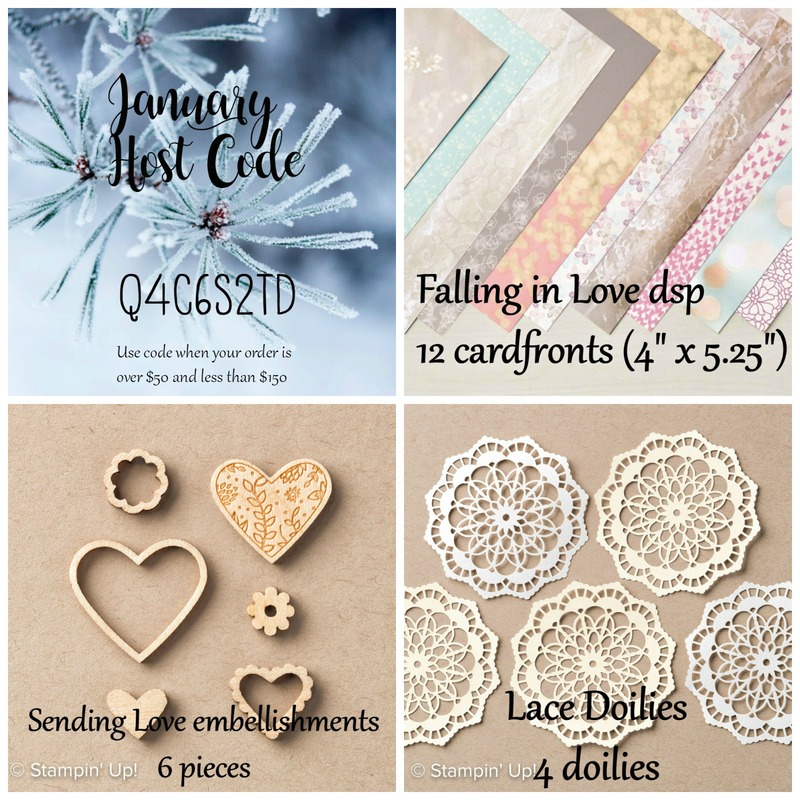 The wooden Sending Love Embellishment is tied on with a piece of Whisper White Solid Baker’s Twine. 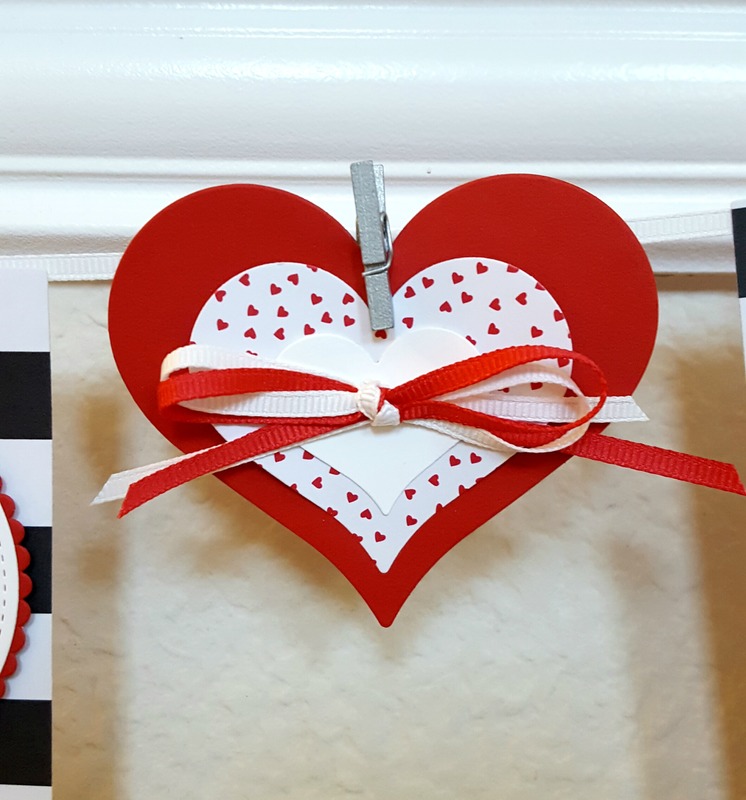 *The hearts between the letters are cut out using the Sweet & Sassy Framelits dies, using Real Red cardstock, Whisper White cardstock, and Sending Love DSP. I tied the two ribbons together in a bow again and then attached them with a Glue Dot. *The XO flags are done a little differently. You could do them exactly the same as the other flags, but I wanted something a little different for my bookends. Okay, really, I had two of these tag toppers sitting on my desk and had already finished all the other flags but really wanted to use these. I cut these flags 2″ wide, then cut the tops with the same tag topper dies, glued the white tag toppers on top, and flagged the bottom edge with the Triple Banner Punch. I made them the same length as the other flags, just skinnier. *I didn’t have anything current to clip the flags to the ribbon, so I used some retired clips. Use whatever you have in your stash. I hope you like my banner. I like it, and my daughter likes it. My son, though, being HASHTAG ALL BOY, ran by it and punched it and knocked half of it off. I was not amused. All the supplies I used in my banner are shown below. If you click on one, it will take you to my store where you can buy it (except the retired clips). I adore this project!!!! So so so many amazing details.